We are ahead in trading, supplying and exporting a wide range of Kidney Tray Various Sizes (Item Code: H.U-01) These Trays are manufactured from quality tested materials and assures long lasting life. With the availability in standard sizes of 6”, 8”, 10” and 12”, these Trays are easily available in market. The thickness of the Kidney Trays is approximately 0.63 mm following international industry standards. These find their wide application in various clinics and hospitals. Customers can avail from us a diversified range of Solution Bowl (Item Code: H.U-02), which are ergonomically engineered by experts. These Solution Bowls are available in market in various diameters of 100 millimeter, 150 millimeter and 200 millimeters. As these Bowls are designed following international industry standards these assures resistance from rust and long lasting performance. 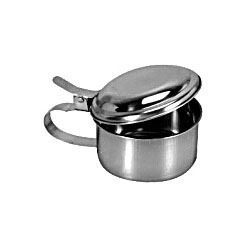 One can avail these Solution Bowls at industry leading rate. Surgical Holloware Instrument - Stainless steel instrument trays with thickness of .5mm is available with varying inner diameter of 8 x 6 x 2 Inch, 8 x 6 x 2 Inch and 10 x 8 x 2 Inch. and many morre sizes etc. 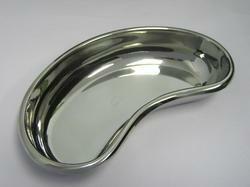 Bed Pan Made of stainless steel with Lid for use in Hospital and clinics for male and female patient, the construction of the bed pan designed which allow to clean quickly and properly, easy to wash and dry, handle on the lid to operate. 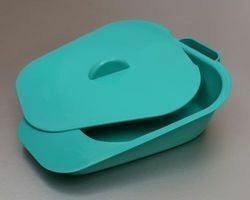 Bed Pan Plastic Provided with LID, the Construction of the bed pan Designed which allow to clean and dry the bed pan quickely and propeerly, the bed pan is very light weight and easy to use, handle provided on the pan and on the lid as well for better use in hygene conditions. Enriched with vast industry experience, we are able to offer our clients a wide range of dressing bowls (Item Code: H.U-03). These Dressing Bowls are specially designed and developed using advanced technologies to assure long lasting performance. 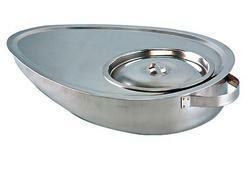 Dressing Bowls offered by us are balanced in the ratio of weight and dimensions and ensure superb performance. 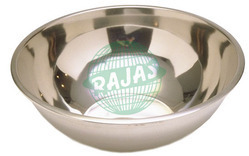 Made following international industry standards these Dressing Bowls are superb in quality and are available in market in various standard sizes of 275 x 132mm, 225 x 225mm, 350 x 240mm, 275 x 240mm and 350 x 130mm. 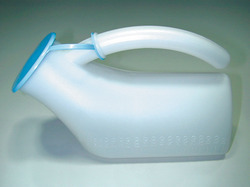 Surgical holloware instrument - urinals for male patients who cannot leave the bed due to their health condition. These urinals are available with the capacity of around 750ml. To 1000 ml. urinal made of stainless steel provided with handle to carry the urinal, easy to clean and wash.
Surgical holloware instrument - round stainless steel sputum cup with cover is 4x2 inches tall and has 100x50mm diameter.